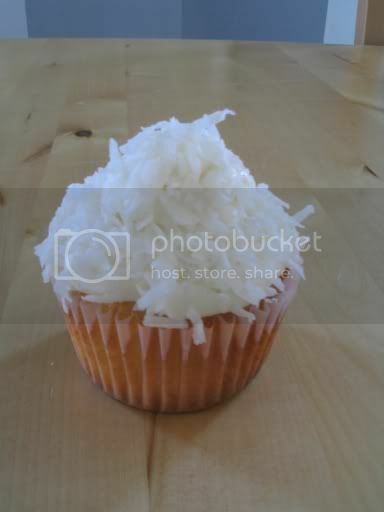 Cupcake, my love: Daring Bakers Will Make You Pucker! Daring Bakers Will Make You Pucker! I must admit when I saw this month's Daring Bakers Challenge I was a little relieved! 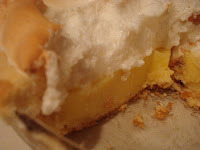 Lemon Meringue Pie...totally doable! I've made crust before, even some form of pie custard and I've definitely made meringue, so I figured I had this challenge in the bag! And what a better way to start the New Year than with a light, refreshing, make ya crave for warmer weather pie! So one cold January day, hours before the Packers were set to play the Giants, in what was to be one of the most upsetting days of my life (sorry Packers:0( ) I set out to complete my DB Challenge. As I went to print out the recipe I was curious to see other DB's experiences and after reading some of the posts I was a little nervous. 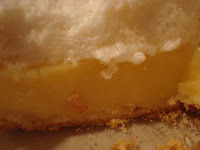 Many DB's were having trouble with the custard and meringue being too runny and ruining their crust. But I calmy read and re-read the instructions and just decided "To heck with it...if it's runny then oh well". I got together all of my crust ingredients, which came together easily in my food processor, which made me very excited. I eagerly placed my crust into it's new glass pie plate home, and tried to give it a little decorative edge...which totally didn't work. Carefully poured my pie weights in, to reveal a "clink,clink,clink" sound that got my heart beating in excitement, and sent the shell off the the oven. When The shell came out I couldn't help but to snag an edge of the crust, which was soo good I was totally ready to get eat the crust by itself. It was so light and flakey and really reminded me of a sugar cookie...I know right! What could be better than a sugar cookie crust! With the crust set off to the side to cool I got to work on the custard. I was sure to watch the boiling points of my custard, not want to over cook it and completely ruin my pie. So at the sign of the first bubbles (thanks to Tartelette's advice) I turned off my flame. 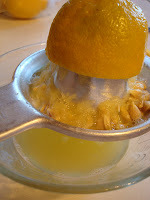 I was in shock at how thick the mixture was, but at how much yummy lemon zing it had from the fresh squeezed lemons! The baby chick yellow of the custard had me mesmerized for a few moments day dreaming of the warm weather that is soon to come. Whoa snap out of it Steph! My creamy custard was poured into it's golden brown pie shell and left to cool for a few hours. Those few hours gave me time to watch my Patriots go on to be champions and left me contemplating the fate of the upcoming Packers game. With my family glued to the T.V. in suspense of Brett Favre's future I was beginning to hear comments about my pie. "Maybe if we had some pie to distract us from the game this wouldn't be so bad!" And that was my hint that it was time to make the meringue. My family is not very patient when it comes to dessert, as you can tell. The clear egg whites sat in the silver Kitcheaid bowl ready to be whipped into stiff peaks, and so they were. Within minutes I had transformed clear mookey liquid into a thick, white peaky pillow. Not waisting a second I plopped my meringue on top of my pie, using my spatula to create some outrageously pointy peaks, gave my pie a good luck blessing and shoved her in the oven. "Beep, Beep...Beep, Beep" the oven was calling my name! With one last prayer I opened the oven door and literally jumped for joy.Sitting in front of my was the most gorgeous Lemon Meringue Pie I had ever seen. 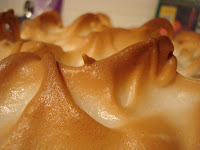 The peaks were a mocha brown but the base of the meringue had kept it's winter white color. With the family pressing my for their pie I cut into the billowing mountain tops with out much time for it to rest. As the knife slowly pulled out the very first slice, I held my breath. And to my amazement I just cut a perfect piece of pie. 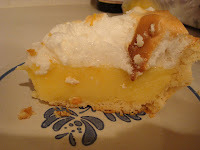 The entire slice came out perfectly, as if I had been making Lemon Meringue Pie from the moment I was born! Words cannot describe to you the sense of accomplishment that I had felt. Not to mention that the taste of this pie was one of the best I've had. Even my boyfriend, who hates Lemon Meringue couldn't help but eat the entire slice that had been handed to him. Daring Baker's Lemon Meringue Pie Challenge: A Success!!! Bring the water to a boil in a large, heavy saucepan. Remove from the heat and let rest 5 minutes. Whisk the sugar and cornstarch together. 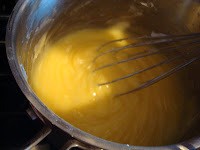 Add the mixture gradually to the hot water, whisking until completely incorporated. Success indeed! Lovely pie, well done! Oh how I longed for that very moment of accomplishment, only to be greated with a watery mess. Im so jealous, your pie is perfect! Well done! It looks like a complete success! Great job! Very nice! Your pie looks lovely. It was an absolutely success I agree! You did a fantastic job. Love the pictures during the process. Oh WOW this is one delcious looking LMP - well done!! Wow, that really is a perfect slice. 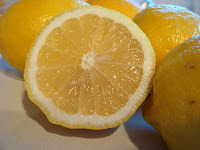 Nice job, particularly on the lemon curd! Glad it was the best lmp you ever had. Good for the boyfriend for eating it...and discovering he liked! :-) Your pie is indeed beautiful. That pie looks great! 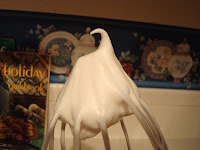 Love the meringue peaks and photos.